Namdroling. All of the ordained sangha in Namdroling have begun the summer retreat known as “Yarné” on 4 August this year. The retreat dates from the time of Shakyamuni Buddha when monks went from house to house with bowls collecting alms from supporters. During the rainy monsoon season, wildlife and insects are abundant, so the possibility of harming a creature is very high. As a result, Buddha instructed the monks not to go out of the boundaries of the monastery, but to wait until rainy season was over. This tradition continues today with our summer retreat. In Tibetan the word “Yarné” is composed of “Yar,” meaning “stay,” and “Né” meaning “in one place,” so the word has come to mean “summer retreat.” The retreat in Namdroling lasts for 6 weeks and consists of daily taking eight vows and remaining in practice for the full day. China. The Nyingma Kama is currently being granted in Baiyu County at Palyul Monastery by Tulku Thubsang Rinpoche. Read his biography here. The Kama teachings were collected by Terdak Lingpa and his brother Lochen Dharmashri (1654–1717/8) were later expanded in the monasteries of Dzogchen and Palyul, and finally published in forty volumes by Kyabjé Dudjom Rinpoche. (From Rigpa Wiki). United States. The summer retreat that lasts from July 10 to August 10 will conclude. The retreat was lead by HE Gyangkhang Rinpoche, Khenchen Pema Sherab Rinpoche, Khenchen Tsewang Gyatso Rinpoche, Tulku Ajam Rinpoche and Tulku Dawa Gyalpo Rinpoche. HE Mugsang Kuchen Rinpoche will attend the closing day ceremonies. To find out more, please visit http://retreat.palyul.org. Our annual retreat started on the 18th of Bumgyur Dawa, which is the first month of the Tibetan calendar, or 11 March 2012. Thus the retreat begins two days after Drupchen, according to a tradition initiated by His Holiness Penor Rinpoche. This year, there are a total of 412 participants at the various retreat levels. Khenchen Pema Sherab Rinpoche leads our Dzogchen class, with 88 participants, including monks and local lay practitioners. Khenchen Tsewang Gyatso Rinpoche is leading the Tsa Lung, or “inner heat yoga,” retreat. There are 104 monks attending at this level. In a separate class, 32 nuns are receiving the Tsa Lung teachings. And, finally, Khenpo Jigme Kalsang Rinpoche is leading the Ngondro, or “foundation preliminaries,” retreat with 188 participants. 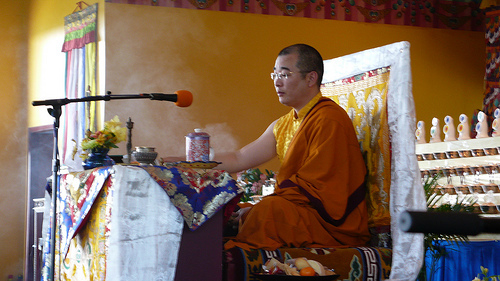 Similar to our retreat format in the United States, the retreats at Namdroling last thirty days. So this year’s retreats will end on the 18th of the second Tibetan month, or Monday, 9 April 2012. At the retreats in India, all teachings are given in Tibetan, since this program is geared toward resident monks and nuns, as well as lay practitioners living in the local area. So, while visitors are always welcome to join our retreats in India, they must also keep in mind that arrangements for all incidentals, including translations, meals and accommodations, are their own responsibility. In the majority of cases, it is much easier for prospective participants to attend the retreats conducted at our center located in the United States, which takes place every year from 10 July to 10 August in McDonough, New York. This one-month retreat program provides the students with translations, meals and comfortable dormitory accommodations. And, in addition to the teachings, structured practice sessions for each of the retreat levels are conducted in airy cabins located on the secluded fields of the retreat center.